Dr. Kara Kockelman is presently Associate Professor of Civil Engineering and William J. Murray Jr. Fellow at the University of Texas at Austin. She obtained her doctorate in Civil Engineering from the University of California at Berkeley in 1998. She also holds Masters Degrees in City Planning and in Civil Engineering from the same University. 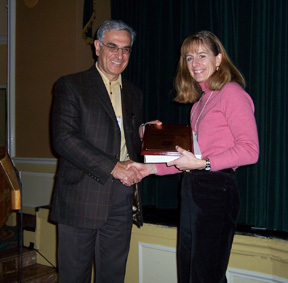 Kockelman has received several prestigious awards for her work, including a NSF CAREER Award for faculty research and teaching (2000-2004) and a Ford Fund CAREER Award (2002). In 2002, the Technology Review magazine of MIT honored her as one of the world’s Top 100 Innovators under age 35, and the Council of University Transportation Centers awarded her its inaugural Young Faculty Award. Kockelman’s primary research interests are in the economic impacts of transport policy, incidence occurrences and the associated consequences, and the modeling of urban systems. The latter include models of travel behavior, trade, and location choice. She has conducted research for the National Science Foundation, the U.S. Environmental Protection Agency, the National Cooperative Highway Research Program, the University Transportation Centers program, and the Texas and Oregon Departments of Transportation. She engages actively her numerous graduate students in her research. Dr. Kockelman presently sits on three Transportation Research Board (TRB) committees. She is also a member of the National Cooperative Highway Research Program’s (NCHRP) Panels on “Statistical and Methodological Standards for Metropolitan Travel Surveys” and “Using American Community Survey Data for Transportation Planning”. She sits on the Editorial Advisory Board of Transportation Research B, the editorial boards of Journal of Regional Science, and Papers in Regional Science. In 2005, she was elected to the North American Regional Science Council. For her exceptional promise as a young researcher in the field of Regional Science, the North American Regional Science Council presents Kara Kockelman with the Geoffrey J.D. Hewings Award.